HerceptinR is a database of assays performed to test sensitivity or resistance of Herceptin Antibodies towards breast cancer cell lines. This database provides comprehensive information about experimental data perform to understanding factors behind herceptin resistance aas well as assays peformed for improving Herceptin sensitivity with the help of supplementary drugs. Best of our knowledge this is the first database developed to understand herceptin resistance, which can be used for designing herceptin sensitive biomarkers. Herceptin Assays: It provides information about 2500 herceptin assays performed to test efficacy of herceptin on various breast cell lines (~ 30 unique cell lines) with and without supplementary drugs (~100 unique drugs). 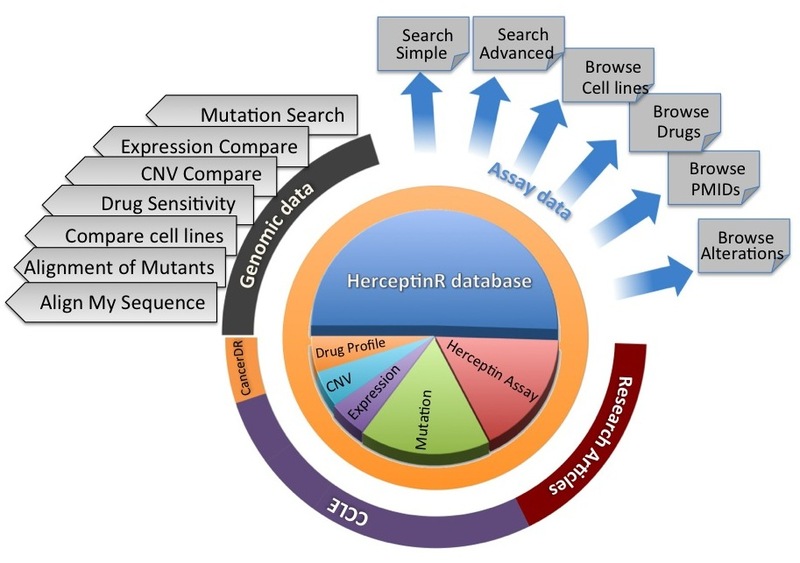 Cell Line Data: This database also provides comprehensive information about breast cancer cell lines (e.g., mutation, copy number variation, expression of genes), in order to facilitate user to design herceptin biomarkers. Important Genes: Comprehensive information about herceptin resistant genes (due to their mutation or altered expression), reported in literature. Web Tools: Number of tools have been integrated that include comparison of gene functions (expression, CNVs, mutations) of sensitive and resistant cell lines. Potential Applications: Major aim of this database is to assist researchers in designing hercepting biomarkers to test whether hercepting will work or not for a specific patient. Before treating a breast cancer patient with Herceptin, its biomarker genes may be examined. If Herceptin is not suitable for a specific breast cancer patient, one may examine whether Herceptin with supplementary drug can be used to treat this patient. We collect and compile data from literature and databases with hope that it will be useful for designing biomarkers, in order to treat breast cancer patients effectively.